A continuation of the Easy Open series, “Pulp on the Horizon” is a large scale micro-mural that depicts a scene of tangerine carnage using several layers of woodblock relief. 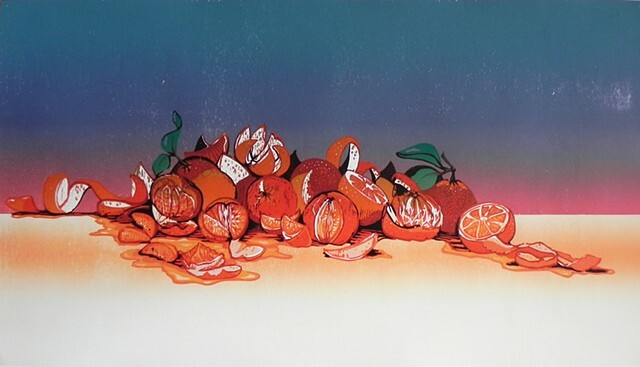 In this work the visual aspects of tangerines are explored at a micro-level, as it can be read as a landscape, a war scene, and a kitchen counter all in one. The scene depicts a close up version of some opened tangerines but the sheer scale of this work makes the pith seem like mountains, the rind as a leathery carcass and the deserted seeds left in solitude like fallen soldiers. Image Size 25”h x 44”w, Edition of 4.